Every year on his birthday, an ardent Shah Rukh Khan fan buys a piece of the moon (you heard that right!) and sends it to him. 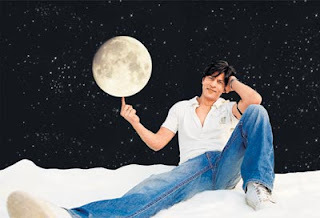 SRK confirms, "Yes, an Australian lady buys a little land on the moon for me every year on my birthday. She has been buying it for a while now and I get these certificates from the Lunar Republic Society." SRK adds that he has met his fan and she keeps in touch with him all year through mails, "She writes me colourful emails (in the sense one line is red, one is blue and so on). I feel blessed to have the love of so many people worldwide." According to one online lunar real estate agency,http://www.lunarregistry.com/, the Sea of Tranquility is the most sought-after address on the moon. 1 acre (approximately 43,560 sq ft, or 4,047 sq mtrs) costs US $37.50 (Rs 1758.75) and the actor owns several acres there. An ownership package includes a beautifully engraved parchment deed, a satellite photograph of the property and an information sheet detailing the geography of your region. An interactive Full Moon Atlas on CD-ROM is available at an additional cost. You are allowed to purchase up to 40 acres per transaction. The proceeds from the purchase of the plot on the moon, go toward the Lunar Republic Society's program for privatised human-based exploration, settlement and development of the Moon. Now while there are many websites on the internet (based in the US, UK and Russia) that allows you to buy land on the moon, it doesn't mean you can charge NASA or other space agencies for trespassing when they land on your property. Property ownership is permanently registered by the International Lunar Lands Registry in its annual publication, which is copyrighted and deposited in the United States Library of Congress and with international patent and trademark offices, including the United Kingdom (UK Patent Office), Japan (Japan Copyright Office), Russia (Rospatent) and with the United Nations (UN Depository Library), in compliance with the Berne Convention.